This is my perfect cooking scenario: I walk into the farmers market with an open mind and no preconceived recipe idea. I take a quick scan and an idea instantly pops into my mind. I grab zucchini, tomatoes, cilantro, basil, these gorgeous amaranth greens, and we head home. (Ok, we stop at the doughnut stand, and then head home). Later that night, I start chopping, mincing and simmering. Jack works on the computer upstairs and instead of being mad that he’s working yet another weekend, I go to my zen place of carefully balancing flavors over the stove. Lemongrass, coconut and lime zest perfume the kitchen. He comes down, we pour wine. I continue simmering and we taste… it’s nearly perfect. Maybe a pinch of salt. 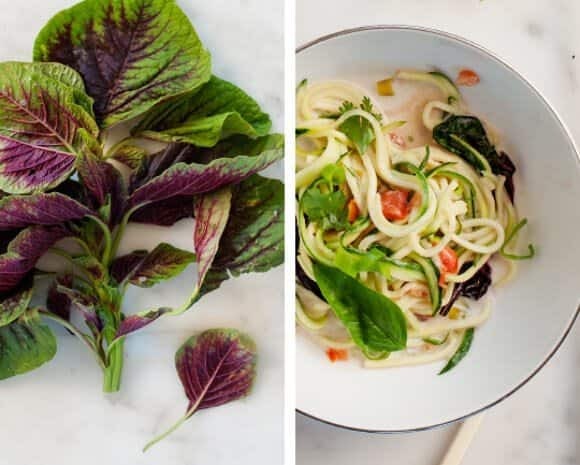 I layer in diced tomatoes, barely wilted amaranth greens, herbs, and pour it over my zucchini noodles. Everything comes together exactly how I had envisioned and then it even sits well for the camera. Click, click, click, and then we lovingly sit down and enjoy sunday dinner. I promise, this never happens. At least not from start to finish. Heat coconut oil over low heat. Add most of the scallions, grated ginger and the lemongrass piece (whole, you'll remove it later). Add the coconut milk and fish sauce and simmer over low heat, stirring occasionally, while you prep everything else. (about 20 mins). Add lime juice and a pinch of sugar. Taste and adjust. If it becomes too thick as it reduces, add a few tablespoons of water. Dice & deseed your tomatoes and add those to the pan. Prep zucchini noodles and set those aside. Chop amaranth leaves and add those to the pan. Stir them in until just wilted. Add basil and stir until wilted. 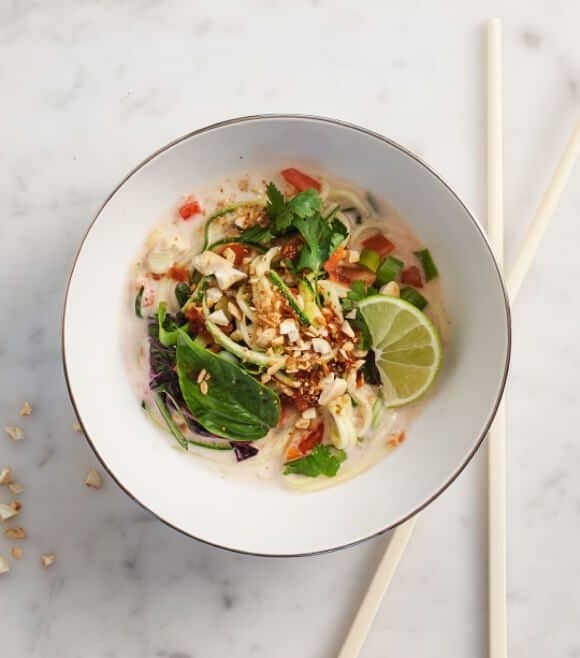 Turn heat off, remove the lemongrass piece, add zucchini noodles and serve into bowls immediately (you don't want the zucchini noodles to cook). 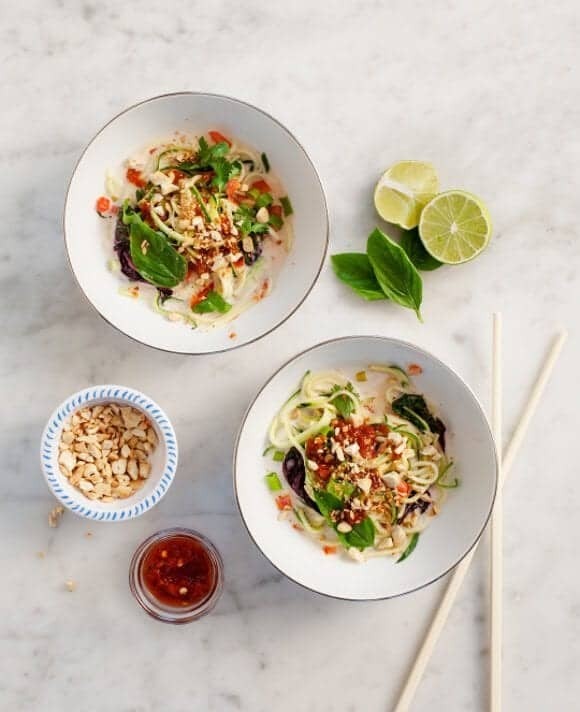 Top bowls with cilantro, crushed peanuts, and serve with chili-garlic sauce. sidenote: even if you’re not a gadgety person, I highly recommend getting a julienne peeler. I’ve all but quit using my vegetable spiraler because it’s a huge contraption to drag out. You can get a julienne peeler for as cheap as $9, and it takes up no space in your drawer. this looks and sounds so perfect! I recently (I know, VERY late to the party) got a julienne peeler and I can’t stop. Anything and everything must be shredded. Always a fan of these flavors too, can’t wait to try it. Yummy dish – great for summer!!! My word. This sounds all too, too familiar – from the snarky comments to the wilty food at the mercy of the camera lens to the rare kismet moments, when it all comes together. Oh, this looks beautiful. It’s glorious when things just all work out so nicely! This is absolutely perfect for summer!! LOVE the coconut noodles! 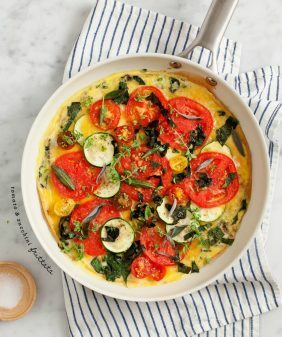 You make healthy food look so incredibly beautiful! I would never think to pair zucchini with coconut milk. I also never knew a julienne peeler existed! I’m definitely going to get one! My kind of meal! 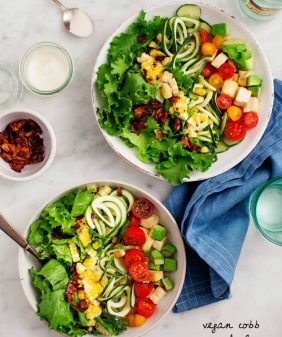 Coconut zucchini noodles? YUM! It’s reassuring that things don’t always turn out perfectly for you either! 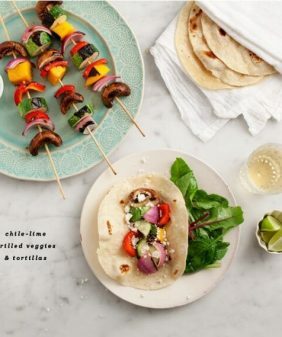 It’s easy when you see these beautiful pictures and recipes to think that it’s as easy as 1,2,3 for some bloggers. Yum!! I can’t wait try this! OK this is my kind of meal. I seriously wish I had everything to make this right now. What a great recipe! This looks and sounds perfect! I must get a julienne peeler! Thanks for the tip, and the delicious recipes. so true! and such a great recipe! I’m glad I’m not the one doing the snarky comments thing. My roommate and I used to make jokes like, “Another quick and easy weeknight meal” (after working on something for upwards of two hours) or, “If it’s easy, why bother?” And now I live and cook with my sister, and we make the same jokes. They ARE jokes, but when we’re exhausted from the chopping and blending and sautéing and everything else that goes into making a vegetarian meal and maybe not even loving the results THAT much, there’s definitely an undercurrent of bitterness. I’m clearly the common denominator, so I was wondering if something’s just wrong with me…but maybe it just goes with the territory of cooking (or undertaking anything else) seriously. Anyway, I’m glad you had an easy, breezy time with this one, and the results still look fantastic. Alright Jeanine, you’ve convinced me to try zucchini noodles! 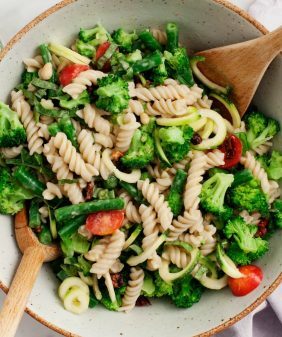 I’ve been struggling with finding better non-starch alternatives for our paleo meal plan members, and I think this is going to be great. Can’t wait to try! 🙂 I just love them! Thank you.This recipe is sublime ! Definitely a keeper. I added roasted tofu and used spinach but will try to find aramanth greens next time. thanks! Glad you liked it with spinach, I realize aramanth is not an easy one to find! One of the best recipes in months. I’ve made it again and again. Thank you! This all too familiar sounding scenario made me chuckle. It is indeed a fine balance between getting ‘the perfect shot’, and spoiling a lovely dinner… A reminder to enjoy the process regardless. This sounds yummy. I am not a big coconut fan though, how much does it really taste like coconut and if so, is there a subsitute? This is just gorgeous! I love it. The flavors, texture, the photography. Beautiful & pinned! I just made this. It was soooooo good! Thanks!! 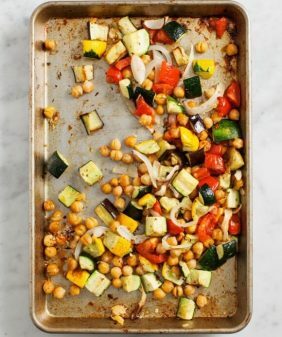 I just made this for dinner the other night and I flipped out- it was so incredibly delicious. So, I went out a bought a julienne peeler just for this. I became obsessed with your gorgeous recipes and wound up all the way back here…It might be the best thing I’ve ever made from scratch. I’m a lazy college student who can’t cook to save her life, and I was sure I’d messed this recipe up until I took my first bite and fell in love. Thank you so much! Had this last night! LOVED LOVED LOVED it! This all too familiar sounding scenario made me chuckle. It is indeed a fine balance between getting ‘the perfect shot’, and spoiling a lovely dinner… A reminder to enjoy the process regardless…. Made this with ground chicken and added mushrooms and red pepper. Came out amazing. 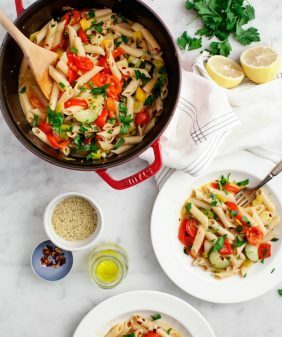 Really loving this recipe!